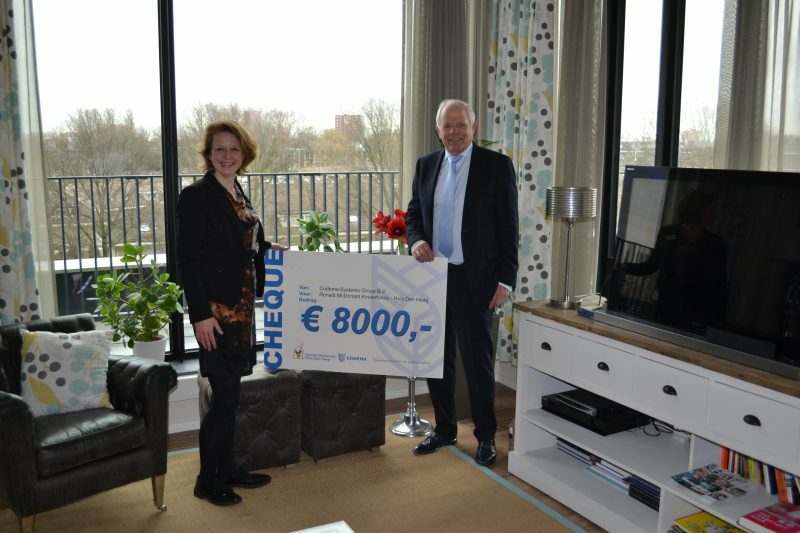 On Tuesday, 12 March 2019, Maarten de Jager, former director of Codema Systems Group, handed over a check for 8000 euros to the Ronald McDonald House in The Hague. This amount of money was donated by all the partners, customers, employees and family who attended his farewell party. The Ronald McDonald House in The Hague provides accommodations for the parents, brothers and sisters of children who are admitted to the Juliana Children’s Hospital. Here, parents of ill children can be close to their child, have a place to rest and find support from other parents and volunteers. The House is not subsidized by the government and depends on donors, sponsors and volunteers. The location in The Hague alone has 90 volunteers who provide staffing from 10 in the morning to 10 in the evening. There are volunteers who buy and prepare food at their expense, and others who take care of maintenance, including toys. Businesses donate items that are needed. There is actually too much to mention to support parents and their families at a difficult time of their lives where possible.